زون متالوژنی بافق- ساغند در ایران مرکزی میزبان کانسارهای عظیم اکسید آهن- آپاتیت (IOA) با Ti کم و یا به عبارتی کانسارهای آهن تیپ کایروناست که حدود 1500 میلیون تن سنگ آهن با عیار میانگین 55 % را شامل شده‌اند که می‌توان به کانسارهای چادرملو، چغارت، سه‌چاهون و اسفوردی اشاره کرد. منشأ این کانسارها مدت‌ها مورد بحث بوده و نظرات متعددی از جمله ماگمایی، هیدروترمال، کربناتیتی، سازند آهن نواری و رسوبی- بروندمی در این باره ارائه شده است. با توجه به مطالعات صورت گرفته تغیرات مقادیر 18O در کانی مگنتیت به عنوان جزو اصلی کانسارهای مورد مطالعه کاملاً سیستماتیک و حاصل فرایندهای مؤثر در شکل‍گیری آن است. لذا در این مقاله به جهت بررسی منشأ کانسارهای اکسید آهن- آپاتیت ± عناصر نادر خاکی در محدوده بافق- ساغند از داده‌های ایزوتوپ پایدار 18O از کانی مگنتیت 4 کانسار چادرملو، چغارت، سه‌چاهون و اسفوردی استفاده شده است. 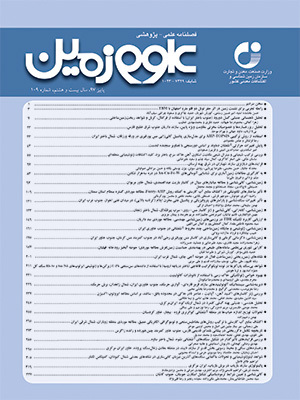 مقدار18Oδ بین 1/0- و 2/2+ ‰ در مگنتیت‌های مورد مطالعه، نقش فرایندهای ارتوماگمایی (بیش از 9/0 ‰) و فرایندهای هیدروترمال (کمتر از 9/0 ‰) را در تشکیل این کانسارها نشان می‌دهد. از طرفی مقادیر کمتر از 3/0+ ‰ را می‌توان به اکسیداسیون ثانوی، هیدروترمال و یا ترکیبی از این دو فرایند نسبت داد. داده‌های به دست آمده مطابق با کانسارهای کمربند آهن ال‌لاکو در شیلی، کایرونا و گرانگزبرگ در سوئد و ژیبو و چاگانگنوئر در چین است که منشأ ماگمایی- هیدروترمال دارند. در نتیجه، با توجه به زمین‌شناسی و ماگماتیسم محدوده‌ بافق- ساغند در ابتدا طی فرایند ماگمایی در ارتباط با نفوذی‌های تونالیت- ترونجمیت- گرانودیوریت، دیوریت و گرانیت، مرتبط با فرورانش حاشیه‌ قاره به سن 525 تا 532 میلیون سال قبل کانی‌زایی اصلی شکل گرفته است. سپس فرایندهای هیدروترمال وابسته به نفوذ توده‌های آلکالن (سینیت و مونزوسینیت) منجر به شکل‌گیری فاز هیدروترمال شده است. لذا می‌توان گفت تشکیل کانسارهای اکسید آهن- آپاتیت با Ti کم در زون بافق- ساغند در ارتباط با فرایند ماگمایی- هیدروترمال بوده است. The metallogenic zone of Bafgh-Saghand in central Iran hosts huge low-titanium iron oxide-apatite (IOA) deposits (also called Kiruna type iron deposits) with more than 1500 Million tons grading 55% iron. The genesis of these deposits including Chadormalu, Choghart, She-Chahun, and Esfordi has long been a subject of debate. In this regard, several hypotheses such as magmatic, hydrothermal, carbonatititc, BIF, and sedimentary-exhalative have been proposed so far. In this study, 20samples of the magnetite ore from the deposits of Chadormalu, Choghart, She-Chahun, and Esfordi were selected and analyzed for their oxygen isotope values. Based on the analyses results, the variations of δ18O values in the deposits are meaningful and result from the characteristics of the ore forming processes involved. The δ18O values of the analyzed magnetite samples range from -0.1 to +2.2‰ and indicate the role of both orthomagmatic (>0.9‰) and hydrothermal (<0.9‰) processes in the formation of these deposits. On the other hand, the values lower than +0.3‰ can be attributed to secondary oxidation or hydrothermal processes and/or a combination of both. The oxygen isotope data of the investigated samples are identical to the deposits such as El Laco of Chile, Kiruna and Grängesberg of Sweden, and Zhibo and Chagangnuoer of China with a magmatic-hydrothermal genesis. According to the geological and analytical evidence obtained from the iron oxide-apatite deposits of the Bafgh-Saghand area, first a tonalite-trondhjemite-granodiorite, diorite, and granite magmatism related to a continental margin subduction at 533 to 525Ma has caused a magmatic mineralization of iron in the area, while a later hydrothermal process related to an alkaline intrusion (syenite and monzosyentie) has caused a hydrothermal mineralization. Therefore a magmatic-hydrothermal source can be suggested for the formation of the low-titanium iron oxide-apatite deposits of the Bafgh-Saghand area. Aftabi, A., Mohseni, S., Babeki, A., and Azaraien, H., 2009- Fluid inclusion and stable isotope of the Esfordi Apatite-Magnetite deposit, Central Iran—a discussion. Economic geology, 104(1), 137-139. Alavi, M., 1991- Tectonic map of the Middle East. Geological Survey of Iran. Scale, 1:5,000,000. Berberian, M. and King, G. C. P., 1981- Towards a paleogeography and tectonic evolution of Iran. Canadian journal of earth sciences, 18(2), 210-265. Boomeri, M., 2012- Rare earth minerals in Esfordi magnetite-apatite ore deposit, Bafq district. Geoscience, 22(85), 71-82. Bonyadi, Z., Davidson, G. J., Mehrabi, B., Meffre, S. and Ghazban, F., 2011- Significance of apatite REE depletion and monazite inclusions in the brecciated Se–Chahun iron oxide–apatite deposit, Bafq district, Iran: insights from paragenesis and geochemistry. Chemical Geology, 281(3), 253-269. Daliran, F., 1990- The magnetite apatite deposit of Mishdovan. Eastcentral Iran, An alkaline rhyolite hosted “Kiruna Type” occurrence in the Bafq metallotect (Mineralogic, Petrographic and geochemical study of the ores and the host rocks): Heidelberger geowiss Abh, 37. Daliran, F., 2002- Kiruna-type iron oxide-apatite ores and apatitites of the Bafq district, Iran, with an emphasis on the REE geochemistry of their apatites. Hydrothermal iron oxide copper-gold and related deposits, 2, 303-320. Darvishzadeh, A., 1983- Investigation on Esfordi phosphate deposit. Journal of Science, University of Tehran. 2-24. Förster, H. and Borumandi, H., 1971- Jungpräkambrische Magnetit-Lava und Magnetit-Tuffe aus dem Zentraliran. Naturwissenschaften, 58(10), 524-524. Förster, H. and Jafarzadeh, A., 1994- The Bafq mining district in central Iran; a highly mineralized Infracambrian volcanic field. Economic Geology, 89(8), 1697-1721. Haghipour, A. and Pelissier, G., 1977- Geological map of the Biabanak-Bafq area. Geological survey of Iran. Haghipour, A., Bolourchi, M., Houshmandzadeh, A., Sabzehei, M., Stöcklin, J., Hubber, H., Sluiter, W. and Aghanabati, A., 1977- Exploration Text of the Ardekan Quderanglemap. Geol. Surv. of Iran. (Tehran, Iran, 88 pp.). Högdahl, K., Jonsson, E., Nilsson, K. and Troll, V., 2012- The Kiruna-type apatite-iron oxide system in central Sweden: geology and geochemical character. In EGU General Assembly Conference Abstracts (Vol. 14, p. 14336). Huckriede, R., Kürsten, M. and Venzlaff, H., 1962- Zur geologie des gebiets zwischen Kerman und Saghand (Iran): Beihefte zum Geologischen Jahrbuch, v. 51, p. 197. Jami, M., 2005- Geology, geochemistry and evolution of the Esfordi phosphate-iron deposit, Bafq area, Central Iran (Doctoral dissertation, University of New South Wales). Jami, M., Dunlop, A. C. and Cohen, D. R., 2007- Fluid inclusion and stable isotope study of the Esfordi apatite-magnetite deposit, Central Iran. Economic geology, 102(6), 1111-1128. Jonsson, E., Nilsson, K. P., Hallberg, A., Högdahl, K., Troll, V. R., Weis, F. and Harris, C., 2011- Oxygen isotopes and geochemistry of Palaeoproterozoic Kiruna-type deposits in the Bergslagen province, central Sweden, in Barra, F. et al. (eds. ): 11th Biennal SGA Meeting, Antofagasta, Chile, 494-496. Majidi, S. A., 2015- Metallogeny of Iron Oxide, Apatite and Rare Earth Elements in the Bafq-Saghand Area, Central Iran. Ph.D thesis. 105 P.
Masoodi, M., Yassaghi, A., Sadat, M. A. A. N., Neubauer, F., Bernroider, M., Friedl, G., Genser, J. and Houshmandzadeh, A., 2013- Cimmerian evolution of the Central Iranian basement: Evidence from metamorphic units of the Kashmar–Kerman Tectonic Zone. Tectonophysics, 588, 189-208. Mohseni, S. and Aftabi, A., 2012- Comment on “Significance of apatite REE depletion and monazite inclusions in the brecciated Sehchahun iron oxide–apatite deposit, Bafq district, Iran: Insights from paragenesis and geochemistry” by Bonyadi, Z.
Mokhtari, M. A. A., Zadeh, G. H. and Emami, M. H., 2013- Genesis of iron-apatite ores in Posht-e-Badam Block (Central Iran) using REE geochemistry. Journal of Earth System Science, 122(3), 795-807. Moore, F. and Modabberi, S., 2003- Origin of Choghart iron oxide deposit, Bafq mining district, Central Iran: new isotopic and geochemical evidence. Journal of Sciences Islamic Republic of Iran, 14(3), 259-270. Mücke, A. and Younessi, R. 1994- Magnetite-apatite deposits (Kiruna-type) along the Sanandaj-Sirjan zone and in the Bafq area, Iran, associated with ultramafic and calcalkaline rocks and carbonatites. Mineralogy and Petrology, 50(4), 219-244. Nyström, J. O., Billström, K., Henríquez, F., Fallick, A. E. and Naslund, H. R., 2008- Oxygen isotope composition of magnetite in iron ores of the Kiruna type in Chile and Sweden. GFF 130, 177-188. Ramezani, J., and Tucker, R. D. (2003). The Saghand region, Central Iran: U-Pb geochronology, petrogenesis and implications for Gondwana tectonics. American Journal of Science, 303(7), 622-665. Ramezani, J. and Tucker, R. D., 2003- The Saghand region, Central Iran: U-Pb geochronology, petrogenesis and implications for Gondwana tectonics. American Journal of Science, 303(7), 622-665. Ramezani, J., 1997- Regional geology, geochronology and geochemistry of the igneous and metamorphic rock suites of the Saghand area, Central Iran (Doctoral dissertation, Washington University). Sahandi, M., Baumgartner, S. and Schmidt, K., 1984- Contributions to the stratigraphy and tectonics of the Zeber-Kuh range (east Iran). Neues Jahrbuch für Geologie und Paläontologie Abhandlungen, 168, 345-357. Samani, B. A., 1988- Metallogeny of the Precambrian in Iran. Precambrian research, 39(1), 85-106. Soheili, M. and Mahdavi, M., 1991- Geological Map of Esfordi: Tehran. Geological Survey of Iran, scale, 1(100), 000. Stöcklin, J., 1968- A review of the structural geology and tectonics of Iran. Bull. Am. Assoc. Petr. Geol, 52, 1228-1258. Takin, M., 1972- Iranian geology and continental drift in the Middle East. Nature, 235, 147-150. Torab, F. M. and Lehmann, B., 2007- Magnetite-apatite deposits of the Bafq district, Central Iran: apatite geochemistry and monazite geochronology. Mineralogical Magazine, 71(3), 347-363. Torab, F. M., 2008- Geochemistry and Metallogeny of Magnetite Apatite Deposits of the Bafq Mining District, Central Iran. Univ.-Bibliothek. Valizadeh, M. V. and Sharifi, A., 2004- Geochemical study of “Arash Syenite” (Central Iran) with special emphasis on alkali metasomatism. Geosciences, 12(53), 2-15. Weis, F., 2013- Oxygen and Iron Isotope Systematics of the Grängesberg Mining District (GMD), Central Sweden. MSc thesis. 83 P.
Williams, G. J. and Houshmandzadeh, A., 1966- A petrological and genetic study of the Choghart iron ore body and the surrounding rocks; Geological Survey of Iran, 18p. Zhang, X., Klemd, R., Gao, J., Dong, L. H., Wang, X. S., Haase, K., Jiang, T. and Qian, Q., 2014- Metallogenesis of the Zhibo and Chagangnuoer volcanic iron oxide deposits in the Awulale Iron Metallogenic Belt, Western Tianshan orogen, China. Journal of Asian Earth Sciences. In press.